A Carl Junction, Mo., firefighter works to extinguish the smoldering remains of the Islamic Society of Joplin mosque Mondayin Joplin, Mo. A mosque in Joplin, Mo. that was the target of an apparent arson attack a month ago burned to the ground on Monday. About 30 federal investigators from the FBI and Bureau of Alcohol Tobacco and Firearms were working with local officials to determine whether Monday's fire at the Islamic Society of Joplin was arson. It will take a few days to determine the cause of the blaze, officials said at a news conference Monday afternoon. "If this fire is determined to be deliberate in nature it will be investigated to the fullest extent possible," said FBI Special Agent in Charge Michael Kaste. "Any act of violence to a house of worship is taken very seriously by law enforcement and threatens the very core of the safety and security that our communities enjoy." Carl Junction Fire Department and the Jasper County Sheriff's Department responded to the fire at about 3:40 a.m. after it was reported by people driving past. The building, which was empty at the time of the fire, sustained a total loss, the FBI said. The FBI and ATF recently offered a $15,000 reward for information leading to the arrest and indictment of a suspected arsonist who was captured on surveillance video on July 4 throwing a lit object onto the roof of the mosque. The suspect in that fire, which damaged the roof, but did not penetrate the building's interior, is still at large. The FBI has posted the video on its website. ATF and FBI respond to all fires that occur in places of worship, a practice put in place after a rash of arson attacks targeting churches in the 1990s, according to ATF spokeswoman Trista Frederick. The Islamic Society's religious leader, Imam Lahmuddin, told the Joplin Globe that worshippers were in the mosque until about 11:20 on Sunday night, and were planning to be back for 5 a.m. prayer on Monday. Muslims are observing the month of Ramadan, which involves fasting from dawn until sunset each day. During Ramadan, many Muslims gather to break the fast in the evenings and pray at the mosque more frequently. "We just take this as a test from God. God is testing us. This is the month of Ramadan. We are fasting. We are not supposed to get angry, we are not supposed to say anything bad," he said. "But that’s not only for this month, but for every day of our lives. In Ramadan we are more careful in guarding our tongues, not to say anything inappropriate." The nonprofit Muslim rights group, the Council on American Islamic Relations, announced Monday that it was offering a $10,000 reward "for information leading to the arrest and conviction of whoever may have caused Monday fire." CAIR called for stepped-up police protection at Muslim institutions and other houses of worship nationwide because of the Joplin mosque fires and Sunday's deadly shooting at a Sikh temple in Wisconsin. CAIR noted that Sikh men who wear beards and turbans as part of their faith are often targeted by bigots who mistake them for Muslims. The ongoing scene investigation involves reconstruction the scene, identifying the cause and origin of the fire, conducting interviews and sifting through debris to obtain and collect evidence related to the incident, the FBI said in a release. 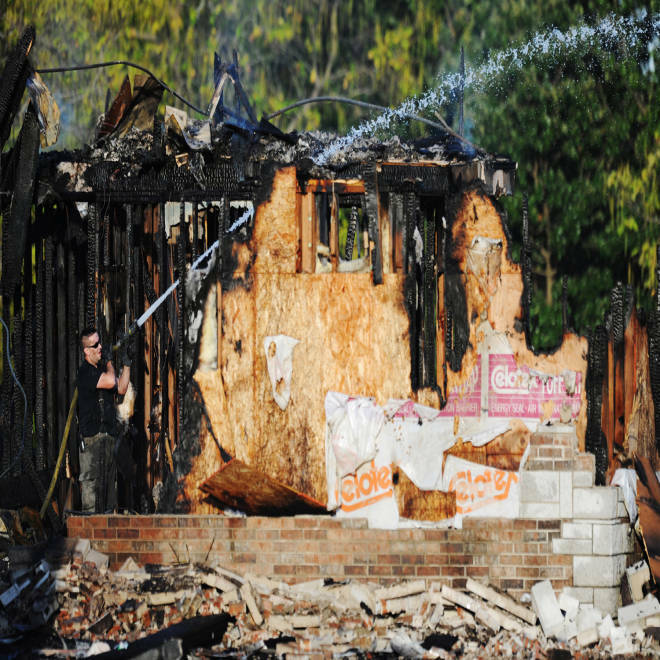 In some cases, the fire damage is too extensive for experts to determine the cause, said Frederick, of the ATF.